Tim Ferris said, “I really feel like knife skills – not just in the kitchen, but in life – are really critical.” Every seasoned camper knows that Tim is right. Having a versatile knife, and knowing how to use it, can help you handle simple tasks and even help you get out of tricky situations. People don’t how helpful knives are until they’re caught in a situation without a knife. But, you don’t have to learn the hard way. Take our word for it – you will be better of with a knife than without one. Now, when you buy a knife there are three main qualities you must consider. First, the knife must be safe. Second, it must be well made. Third, it must be functional. The Kershaw brand stands for all these qualities. They’ve been making knives for over forty years. When you buy a Kershaw, you have their award-winning technologies and advanced materials backing your purchase. Kershaw knives give the best bang for the buck in the industry. And guess what? These knives come with a lifetime warranty against material and workmanship defects. From every day knives used for removing packaging to tactical knives suitable for any events, Kershaw knives must be a part of your essential camping gear list. Are you ready to give yourself the edge? Awesome, continue reading. The Kershaw Leek Knife is proudly made in the United States. It comes equipped with amazing mechanics that puts it miles ahead of its competitors. For a knife of its quality and price, this knife is a steal. The blade can be deployed with either hand. The handle is manufactured from bead-blasted stainless-steel and the blade is made from 14C28N Steel. When closed, it measures 4 inches, and weighs 3.1 ounces. Leek knives come in different handle styles, some that have technologically advanced coatings for enhanced performance. Its aesthetic mechanics make this a must have for any knife enthusiast. If you do not know what nice can do, give the Kershaw 1990 Brawler Speedsafe Folding Knife a try and see the difference. This is the knife for someone who has a serious job to do. After using this knife, you will never resort to mediocre knives again. This knife is equipped with a SpeedSafe assisted opening; Liner lock. It has a 4 position pocket clip. The length of the blade is 3 inches, and has an overall length of 7.1 inches and weighs 3.9 ounces. If you carry a knife for self-defense, the Kershaw 1990 Brawler Speedsafe Folding Knife is exactly what you need. It opens quickly and has a thick, sturdy blade that does not wobble even when dropped. This knife is very inconspicuous while in the pocket and its clip is strong. 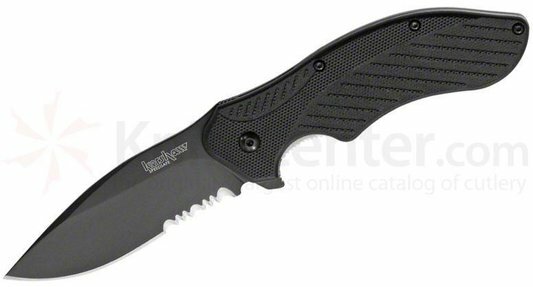 The Kershaw 1605CKTST Clash Assisted 3-Inch Blade with Polyimide Handles is light but substantially built. Compared to other knives, this knife’s SpeedSafe mechanism works wonderfully as an opening system. It is the best one-handed opening knife on the market today. The Speedsafe function makes this an easy, every-day-carry knife. It is equipped with a locking liner, flipper opening, and reversible pocket clip. The handle of the knife is made from textured, glass-filled nylon handle scales. These offer a solid grip as the handle contours fit securely into the hand. A locking liner lock provides a safe, secure, and solid blade lock up. The black Clash is built with precision and offers the fit and finish associated with Kershaw products. If you are looking for style and functionality, this is the knife that will give you both for the price of one. Another feature that makes Kershaw products appealing is that they are backed against workmanship and material failures. You should also keep in mind that Kershaw will sharpen your knife whenever you send it to them, even after the service warranty has expired! When buying a knife, you want it to arrive sharp and stay sharp. The Kershaw Ken Onion Blur Folding Knife with SpeedSafe will not disappoint on this ground. This is an ideal knife for both extreme and everyday activities. Only 10% of the components in this knife are made from plastic. The knife is constructed from Sandvik 14C28N Steel which enhances strength and corrosion resistance. 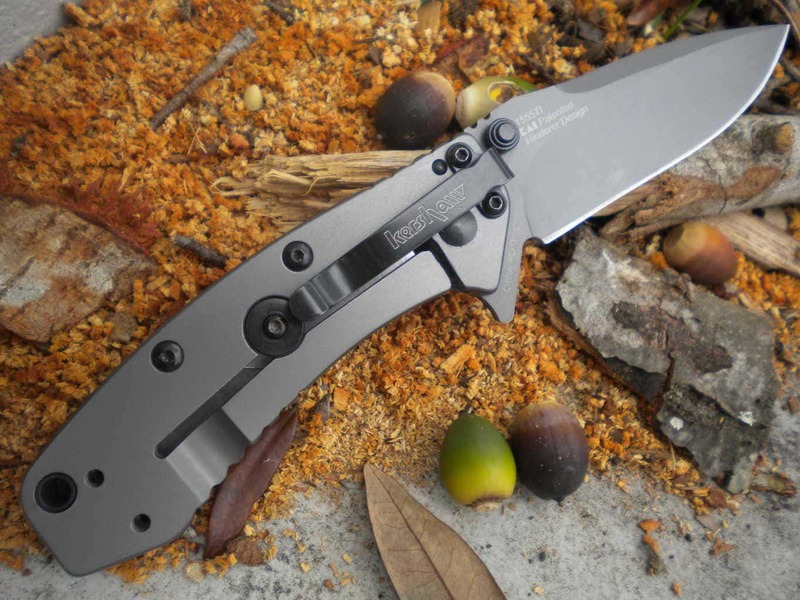 Kershaw’s Ken Onion Blur folding knife features a 3-3/8-inch smooth or serrated blade. The Blur series offers both power and performance. The knife is equipped with a lightweight anodized aluminum handle which offers Trac-Tec inserts that provide a non-slip grip even in wet conditions. The Kershaw’s SpeedSafe assisted opening system helps you to smoothly open the knife with a manual push on the blade’s thumb stud or Index-Open system. In order to prevent the knife being opened by accident when it is closed, the knife is equipped with a SpeedSafe’s torsion bar. The knife’s blade opens smoothly and locks into position, ready for use. This knife is arguably the fastest assisted opener on the market today. If the Kershaw range of knives is known for its class, the Kershaw’s 1660CKT is the epitome of this class. Kershaw engineers ionize metal and deposit it on both blade and handle as microns-thin coating in order to create this masterpiece. It has a 3-inch blade which makes it a good-sized knife. This knife’s blade can easily be deployed with just one hand. The blade length is 3 inches, while the overall length is 7 inches, and weighs a mere 3 ounces. The knife has an easy to carry slim design. The razor sharp blade enhances performance and allows the knife to tackle the most difficult tasks. This is a rock solid knife manufactured from first-class material that makes it the most advanced in its category. The Sandvik steel this knife is made from is the same steel used for manufacturing important medical tools. Even after repeated use, the blade edge will remain razor sharp. If, however, after a long time of use, you begin to feel that the blade needs some sharpening, Kershaw will gladly sharpen the knife for free and return it to you as good as new. When it comes to roughing it out in the outdoors, no single equipment is as versatile as a knife. You can use it to hunt, dress, cook, and eat game. Need to start a fire? No problem, just make a bow drill with your trusty knife. Oh, and you can use your knife to split wood to feed that fire. Let’s see some more ways in which you can use a knife. A knife can help with first aid if you cut or bruise yourself. It can double as a replacement for a fork. You can use it open cans. You can use it to make tools. And, if you’re trained, you can use a knife for self-defense. The number of ways in which you can use a knife is limited only by your creativity. If you’re keen on spending more time outdoors, learning knife skills is important. Your life may depend on it. The knives listed here are the best knives to start with. Once you become adept at using a 3-inch blade, you can upgrade to a hunting knife or a tactical knife. Even then, having a 3-inch blade around helps tremendously. If you’re ready to unleash the Bear Grylls in you, we recommend you get yourself a knife ASAP.